There are few more glorious natural settings for golf than this stretch of heathland surrounded by woodland of pine, oak and birch; the vibrant rhododendrons adding a splash of colour. The heavily wooded landscape has aesthetic and strategic benefits in the sense that it is both easy on the eye and ideal for creating well-defined hole routings. The great architect Harry Colt took full advantage of these many attributes when he created the West Course. Fairways turn both ways and there is a wonderful flow and variety to the course, with pleasing elevation changes and different length par-3s, par-4s and par-5s. It is a design that had for decades proudly stood the test of time. 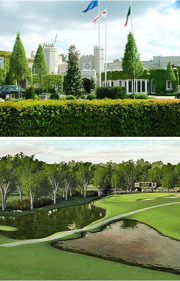 However, due to the massive advances in equipment technology it was felt in recent years that in certain key areas the West course no longer played quite as Colt had intended and so a process of modernisation and restoration was undertaken by long-time Wentworth resident and seven-time World Matchplay champion Ernie Els. This renovation project started in 2005 with extensive re-bunkering and lengthening of certain holes, where appropriate. These revisions retained the essential character of the golf course and successfully restored many of Colt’s original shot values, bringing a classic piece of work into the modern world. The final phase of renovation and modernisation, which concluded in March 2010, involved the construction of 18 new greens and greens' complexes to USGA specification to ensure they perform to the absolute highest standards. All greenside and fairway bunkers were also reviewed, remodelled and where necessary removed with new bunkers positioned more 'in play'. The West Course is a challenge entirely in keeping with the demands of the 21st century game and, thanks to these renovations, is also 'future-proofed' for many years to come - a stern test, but above all a fair test. It examines every department of a golfer’s game and demands shots played with every club in the bag.